Abstract florals on this classic cut tunic – it can be dressed up or down. There’s no fabric trend more enduring than florals. From floaty and feminine to bright and bold, florals on fabrics have been a fashion fixture throughout the years, always returning with a strong reinvention to add colour and break up monochrome wardrobes. We’re excited to see that floral fabric has once again fought it’s way back as a global fashion favourite of the season, featuring on pieces from high fashion to high street. It makes sense that more and more fresh floral prints will start to emerge as spring season stock appears in stores. What easier way is there to add a quick pick-me-up to the black and grey hues of your winter wardrobe? Florals are the ideal way to add personality to your outfit without having to necessarily go for bold colours or patterns. It’s practically impossible for any kind of floral print to not look gorgeous against a solid neutral shade, so they are a great safe option if you want to add a bit of interest to your outfit without going too way out. For those who are a little more daring, now is your chance to break out those top-to-toe perennial prints! And while spring blooms might not be an unexpected fashion trend, this season’s florals are anything but your garden variety. Let’s take a look at the best of the floral fashion trend 2016 and how you can make it work for your wardrobe. Gone are the dainty blooms of previous floral trends. This season has seen a rise in floral prints with darker hues and bolder patterns. These prints are often juxtaposed against typically edgier fabrics such as leather (or faux leather) to create a fun, modern look with a hint of femininity. A tunic dress is a versatile piece that can take you across several seasons. 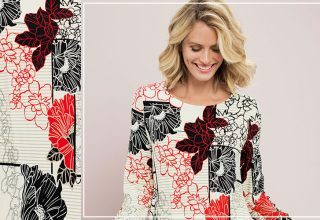 Choose one with a bold floral print – it will keep eyes moving, pulling attention away from parts of the body where it might be fitting a little more snug. Pair with leggings and boots and you have a bright outfit that will transition from winter through to spring. We can easily become accustomed to jeans and black pants through winter – it’s easy to match just about any crew or jumper with them. But the floral pant challenges you to step out of your comfort zone with this season’s trend. Floral print jeans are totally on point when executed well. Match a monochrome or block colour top with a feature colour in the jean, and choose a heel that matches your top for a sophisticated look. This season’s florals are split into two styles – abstract and realistic. Abstract florals have sprung up on catwalks and high-fashion pieces globally, featuring stretched, distorted or exaggerated blooms for a fresh interpretation of the traditional floral trend. You’ll see less of the delicate pastels and darker, edgier colours and designs. If you feel that florals are usually a little too fussy for your tastes, you’ll be pleased to see that even minimalists can get on board with botanical prints this season. Fabrics featuring larger florals, sometimes with no distinct pattern, are currently on trend. If you’re after an even subtler take on the trend, try a lacy floral overlay on a dress or skirt. If you’re after an even subtler take on the trend, try a lacy floral overlay. Shop the Capture Shirt Tunic. Rest assured that femininity hasn’t completely disappeared from this season’s florals, but the trend looks to fabric to help maintain the softer look. Ultra-feminine fabrics like chiffon, silk and lace in muted colours maintain a delicate elegance and will soften the harshness of winter wardrobes as you transition into warmer weather. Florals are once again finding their feet in fashion, and it’s great to see the traditional floral print transform itself to accommodate a range of styles and tastes this season. From edgy and bold to soft and feminine, the floral print is certainly making its mark – how will you wear yours? Proving florals can be rocked all year round, Capture give us their Print Tunic in stunning floral print. A killer look with tights and boots, this tunic can be worn several ways – we’ll be pairing ours with black leggings and knee high boots. Layer over leggings, trousers or jeans for a vintage inspired outfit. Perfect for dressed up weekends with leather look pants and heels or teamed with tights and boots – add a cropped blazer to dress this look up. This velvet like shirt will add depth and detail to any outfit, we especially love it paired with a tapered black pant and court shoes. Shop the Capture Print Tunic, Capture Button Tunic, Capture Burnout Tunic, Capture Shirt Dress, Capture Shirt Tunic.